Sri Lanka’s Central Bank is hopeful that the island nation’s US $87 billion economy would grow at least 4 percent this year, despite both International Monetary Fund (IMF) and Asian Development Bank (ADB) revising down their growth forecasts to 3.8 percent recently. Sri Lanka’s economy grew 3.6 percent in the first half. For the economy to achieve a 4 percent full year growth, it has to grow at least by 4.4 percent in the second half. “At the last meeting I said we could grow 4, for which we have to grow by 4.4 percent in the second half. I know that would be a stretch. But I’m hopeful that we would grow 4 percent,” Central Bank Governor Dr. Indrajit Coomaraswamy told reporters in Colombo yesterday. With the recovery in agriculture sector and growth in both services and industry sectors that was witnessed during the second quarter, the Central Bank expects the economy to expand during the remaining quarters of the year at a rate higher than the first half of 2018. Meanwhile, Governor Coomaraswamy noted that the rupee is stabilizing against the dollar as a result of the temporary measures taken recently to discourage consumption imports. He said the Central Bank is striving for a competitive exchange rate and stressed that the current panic on the rupee depreciation against the US dollar is unwarranted. Governor Coomaraswamy urged that the global conditions have changed and moneys that flowed into emerging markets after the 2008 global financial crisis are now going back to advanced economies with the strengthening of the US economy. He also noted that the global oil prices which remained low for an extended period are also now moving up. In a surprising move yesterday the Central Bank in its 6th monetary policy review for this year kept the policy interest rates unchanged, despite many analysts betting that the monetary authority would increase rates in line with other Asian region economies such as India, Malaysia, Indonesia and Philippines. The Monetary Board of the Central Bank kept the Standing Lending Facility Rate (SLFR) at 8.50 percent and Standing Deposit Facility Rate (SDFR) at 7.25 percent. The market had expected hikes for both. Explaining the key reasons behind the Monetary Board’s decision, Governor Coomaraswamy said Sri Lanka already has higher nominal and real interest rates compared to some of the countries who had raised interest rates at least a couple of times during this year. Relatively slower growth, moderating money supply and credit growth, contained inflation and tight liquidity conditions were cited as the key reasons behind the policy decision. “Those economies have higher growth and they also have lower nominal and real interest rates. We already have a greater tightening bias compared to a lot of countries,” he said. Further justifying the Monetary Board’s decision to hold on to the policy rates, Governor Coomaraswamy said at this juncture a rate increase would not have either brought in new money into the country or encourage investors, who are already here, to stay. “In the current conditions, where there is money moving out of the emerging markets, given that Sri Lanka is a twin deficit country, chances of Sri Lanka attracting new money are very low. Then you have to ask whether can we keep the people who are already here by increasing rates? We have US $ 1.5 billion worth of institutional investments in rupee securities at the moment. By increasing interest rates will we encourage those people to stay here? The answer to that is also no. Sri Lanka on a net basis has spent US $ 184 million so far this year to defend the rupee and the rupee against the dollar to date has depreciated 9.7 percent. Sri Lanka burnt over US $ 3 billion by unsuccessfully trying to defend the rupee in 2015 and another US $ 4.1 billion in 2011-2012, which ultimately ended up in the country seeking IMF assistance. “So, this is a better package than what was introduced earlier,” Governor Coomaraswamy said. Sri Lanka’s foreign reserves currently stand around US $ 7.3 billion and the Central Bank expects to end the year with US $ 8.3 billion, down from the earlier target of US $ 9 billion. Sri Lanka may go for an International Sovereign Bond (ISB) issue before the end of this year on top of the plans to raise US $ 500 million through Panda and Samurai bonds. 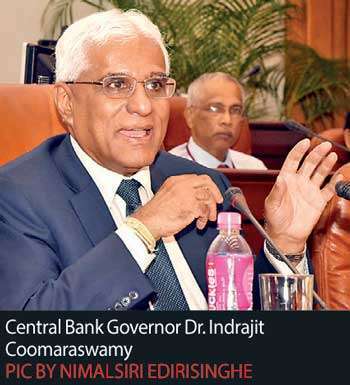 Central Bank Governor Dr. Indrajit Coomaraswamy said the Central Bank wants to go for the ISB “as early as possible” before the interest rates go up any further. Sri Lanka will also be receiving US $ 1 billion from the China Development Bank as a syndicated loan in a couple of weeks time, and the Central Bank may look at upsizing the loan to US $ 1.5 billion, given the attractive 5.25 percent interest rates attached to the loan. Mirror Business a couple of weeks ago exclusively reported Central Bank’s plans to raise US $ 250 million through a Panda bond issuance with the assistance of People’s Bank of China before the end of this year. The Central Bank is expected to call for expressions of interest to appoint lead managers to the issue shortly. Japan Bank for International Corporation (JBIC) backed US $ 250 million Samurai bond issue will most likely to be issued early next year.